Good Afternoon! The Red Bulls are back in MLS action today in a massive away game, @The Home Depot Center, against the league leading Los Angeles Galaxy (11:00pm ET, ESPN2). The Red Bulls, coming off a bizarre 2-2 draw against Dallas, will be looking to avenge the 1-0 loss suffered against the Galaxy @The Cathedral of Football. The Galaxy is coming off an impressive come-from-behind victory against lowly DC United and will be looking to add another 3 home points to the current tally. This one is being billed as the Game of The Season, but that's a bit much, in my opinion (I'll agree with A Clash of Titans, however - ha, ha). Both teams are coasting into the playoffs and, barring a major meltdown, the Galaxy has 1st place in the Western Conference all but assured. Donovan and Buddle are as hot as ever and even David Beckham has returned from injury. Becks might even make his first start of the season, in this one, although he might be a bit "unsettled" as a result of his current off-the-field problem. Meanwhile, the New York Red Bulls have 2nd place in the Eastern Conference all but locked up (again, barring a major meltdown). Unfortunately, the team travels west without its biggest star. After all the crap this past week about The Henry/Hartman incident, it turns out that TH14 will not play. Mr. Backe has decided to sit him out of this one so he can recuperate from an injury suffered a few weeks back, against RSL, and so he can furnish his brand new SoHo Penthouse. Just kidding, of course. Another recent Red Bulls acquisition, one Carey Talley, might make his first start for the team, if Right Back Chris Albright is ruled out with the groin injury he sufferd earlier this week. With all that in mind, let's get to some predictions! Remember all the buildup for the game this two teams played at Red Bull Arena and what a dull match it turned out to be? 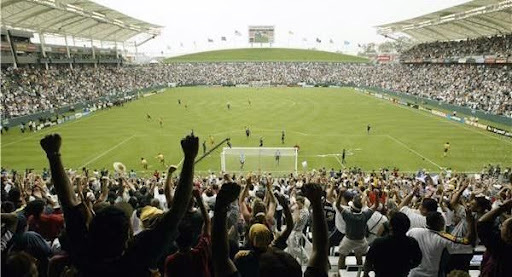 I have a feeling we may see a repeat of the same on Friday night at the Home Depot Center. There has been an almost unprecedented level of hype about this match and I have the nagging feeling that the reality, once again, will not live up to the anticipation. Henry is out, obviously making things more difficult for the Red Bulls, but then again Omar Gonzalez will be missing for LA. I can see this ending in a 1-1 draw. Angel will score for RBNY and let’s give (another) one to Buddle for LA. I going to go out on a limb and predict a tie here. Usually, I would predict a loss against the Galaxy @The Home Depot Center, but their best defender is out and Juan Pablo Angel will have something to prove, after being benched last week. I'm saying it's going to end up 1-1. Billed all week as the MLS Marquee Matchup, a little luster was lost from the Red Bulls/Galaxy match when it was announced that Thierry Henry would not travel to Los Angeles as he nurses a tweaked knee. On the bright side, this clearly paves the way for a return to the Starting XI for Juan Pablo Angel after his role as a sub last week. Much is made of the midfield matchups, with Beckham and Donovan squaring off against Marquez, Ballouchy, and our improved wing play--Joel Lindpere has 3 assists in our last 4 matches, Dane Richards a goal and an assist. Honestly, though, our midfield won't matter much if our back line plays like it did last week against Dallas. If Eric Alexander can pick us apart like that, we may not want to see what Donovan and Edson Buddle can do. That said, our back line, with a healthy Rafa Marquez in front of them (he's been nursing an ankle since Colorado, apparently, but now says he's much better) have put up some solid games, too. And with Ballouchy settling in with his teammates for another week, I have to believe we are going to create some havoc of our own. Grabbing a point in L.A., in the midst of this very tough stretch of games, has to be considered a success, and I think it is what we will do. I see an entertaining 2-2 draw. Goals for Angel and Richards. Good news and bad news. Bad news is that we will lose. Maybe get crushed in the process. Good news. This will be our last loss of the season. Following this we will run the table. Take top spot in the East and win the Cup as a result. So remember when you are ripping your hair out and posting obscenities and calling for heads to roll at 1 AM on Saturday morning; well it will be the darkness before the glorious dawn. I hope I am wrong about Friday but I see LAG doing us 3-1 with Buddle and Donovan doing what they do in front of a sellout crowd. JPA or Joel will get one back to make it exciting at some point, but at the end it will be a long flight home. We all know about that one from 2008. But fear not. After tonight we return to the Cathedral for the rest of the season with the exception of the crusade to the ghetto of Chester. We will wind up with 53 points and be champions of the East. Then it will be 4 days in November and TOTAL GLORY! PRAISE BACKE!!! PRAISE SOLER!!! and HOSANNA IN THE HIGHEST TO UNCLE DIETRICH!!!!!!!!!!!!!!!!!!!!!!!!!!!!!!!!!!!! Alrighty then! Well be back in the coming days with our Award-Winning analysis. Viper Out!